Over the past few years I have started to mountain bike. That new sport got me onto trails I never knew existed that were right in my backyard so to speak. As I rode I would track myself so I could better make sense of the maze of trails I was riding. Those tracks would get imported into Caltopo and I started getting a good quality map of areas. The Mount Washington Valley has numerous areas but can be broken up as East Side and West Side. Those two sides can be further broken up into two sections each splitting the valley into quarters. The West Side has the Marshal Property to the south and the cliff area to the north. The East Side can be broken up by Black Cap area to the north and the Thompson/Walmart/Outer-limits area to the south. This last area is the most dense area of trail and would make North Conway a special area for biking if it were the only place to bike. For that reason it is the focus of this map. Numerous maps exist but trails get relocated or new ones get built. As far as I have found this map is the most accurate and complete but expect some adventure. NoCo biking is; low key, loosely organized and not overbuilt. In short it’s a great low key place to ride and people want to keep it that way. 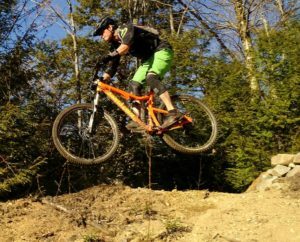 Most if not all of the trails are built by the White Mountain Chapter of NEMBA and East Side Bike Guides and are free to use, please support them any way you can. 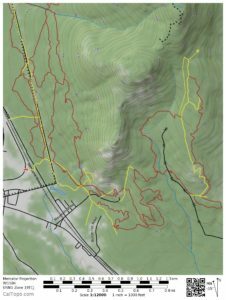 You can also find more maps here The trails on the map below cross; town, state and private conservation land. Please be respectful of closures and trails that are hiking only. Mountain biking is well accepted and the areas that are closed are few and for good reason. The map is a Geopdf and will interface with the GPS in your phone if you use the Avenza App.